HISP INDIA provides services around a suite of health informatics products for the public health sector. All these products are based on free and open source platforms to provide the users with the freedom of having full control of their applications without the risk of vendor lock-ins to high-cost proprietary licenses. "Critically study openness: Critical perspectives on information systems and openness: Emerging discourses, meanings, models, and implications” is to advance a critical debate in Information Systems research on the theme of openness. Research in information systems on openness has focused on the nature of technology and how openness contributes to the development of new opportunities for technological and institutional enhancements even as it introduces various limitations. However, more often than not, we take for granted the positive potential of openness guided by a market-driven focus, which tends to marginalize potential distortions understood through interpretive, critical, and contextualized social theoretical positions. The aim of this special issue is to move beyond positivist and functionalist approaches, which merely promote rhetoric and hype, and critically and interpretively explore and explain the nature of openness and its enabling and constraining role in our pursuit for technological and institutional innovations. The aim of this special issue is thus to offer a venue for the critical study of the phenomenon of openness and its impact on people, organizations, and societies. Publications and other Documents of INTPART Project. Primary health care (PHC) builds backbone of an effective health-care system by integrating care for individuals, their families and communities. Primary healthcare services require information systems to identify needs of the community, healthcare providers, managers & planners to improve healthcare provisioning & monitoring. To meet the above mentioned requirements an integrated health information system which can support universal health coverage has been built on an open source & free DHIS2 Tracker platform using living lab concept with active engagement and ownership of health functionaries. It covers all major national health programmes (RCH, NPCDCS, RNTCP etc) and is easily customizable as per the needs of the user. 1. North Zone Indian Association of Preventive and Social Medicine (NZIAPSM), 2018 at Ludhiana, Punjab, 8-9 April 2018. 2. HSR2018 - Fifth Global Symposium on Health Systems Research, Liverpool, UK, 8-12 October 2018. 3. 13th SEA regional meeting of the IEA jointed with International Conference of Public Health and Sustainable Development to be held from 2-5 October 2018 at Bali, Indonesia. In 2016 World Health Organisation launched the Global Leprosy Strategy 2016–2020: Accelerating towards a leprosy-free world, which aims to reinvigorate efforts to control leprosy and avert disabilities, especially among children still affected by the disease in endemic countries. • Detecting cases early before visible disabilities occur, with a special focus on children as a way to reduce disabilities and reduce transmission. • Targeting detection among higher risk groups through campaigns in highly endemic areas or communities. Till 2016, the annual leprosy statistics were collected through paper-based reporting forms, filled scanned and emailed to the Global leprosy programme from nearly 100 countries across the world. Similarly MDT request including data on existent stock were filled and emailed to the drug manager/logistics in charge in WHO Neglected tropical diseases department based in WHO HQ. The data received were entered into MS Excel spreadsheet and analyzed for defining trends and presenting in Global Leprosy Update annual publication. Several countries are positively disposed to use DHIS2 in their national programmes since they were familiar with the software. WPRO has been using it to report leprosy data for the past five years. Therefore WHO decided to build DHIS2 based information system for data collection and visualization of data using built-in dash board in DHIS2 application. Several countries positively disposed to use DHIS2 in their national programmes. Considering the level of acceptance and familiarity in using DHIS2 by large number of countries a trial was made in 2017 in consultation with HSD and support from SEARO ICT to use DHIS2 application for collecting annual leprosy statistics. Services of HISP were contacted for developing the DHIS2 application and use by GLP. Develop an effective data management system to measure reduction of disease burden due to leprosy globally covering all countries in six WHO Regions. Introduce one data repository/reporting system for national programmes to inform about leprosy situation and request/indent for multi-drug therapy (MDT). 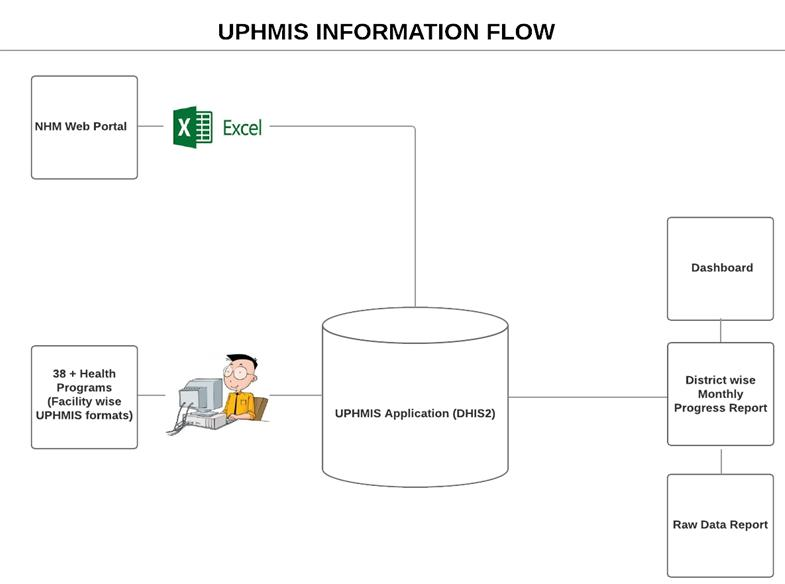 Uttar Pradesh established routine HMIS reporting by entering facility based data into the national HMIS portal. As a step towards this Government of Uttar Pradesh has initiated a process to implement DHIS2 through a partnership between HISP India, Noida and IHAT, Lucknow, UP. Uttar Pradesh State decided to use of DHIS2 for designing of integrated UPHMIS. Facility based data is being entered at block level for each facility. Though the data reporting systems have stabilised, the state has initiated the process of focus on integration and use of data for information and action. • Building capacity in collaboration with IHAT-UP for super users and master trainers to support evidence-based decision making. International Plan Parenthood Federation SARO decided to adopt the DHIS2 application for service data capturing, collation, analysis, report generation and performance monitoring of service delivery points. International Planned Parenthood Federation (IPPF) works in 172 countries to provide support, advice, service and supplies relating to any aspect of Sexual and Reproductive Health (SRH) through IPPF Member Associations (MA). In this phase the project intends to cover 9 South Asian countries including Nepal and Pakistan, which come under the South Asia regional office. CCMP is currently running in 8 blocks (with different malaria transmission intensity) in Odisha where intervention and control activities are being carried out. The role of CCMP Information system, designed on DHIS2, is to capture name based data at village level for malaria positive cases in 4 intervention blocks and aggregate data on malaria testing and reporting is being captured from all the 8 blocks. CCMP stands for Comprehensive Case Management Programme; currently running in 8 blocks (with different malaria transmission intensity) in Odisha HISP India has developed this application for Medicines for Malaria Venture (MMV) in collaboration with National Institute of Malaria Research (NIMR). 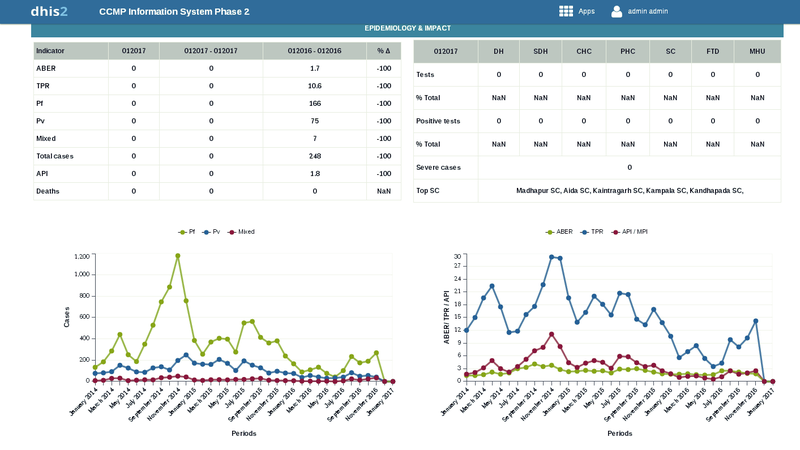 • Easy availability of data for analysis and planning. 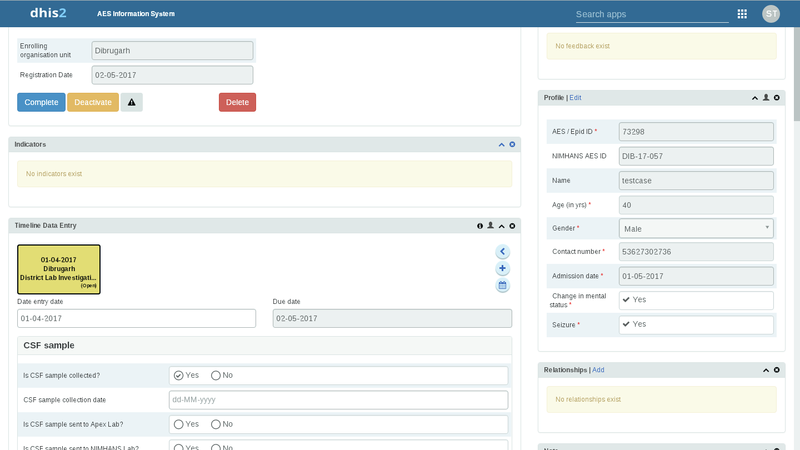 • Improving data quality by avoiding duplicates and validation checks. 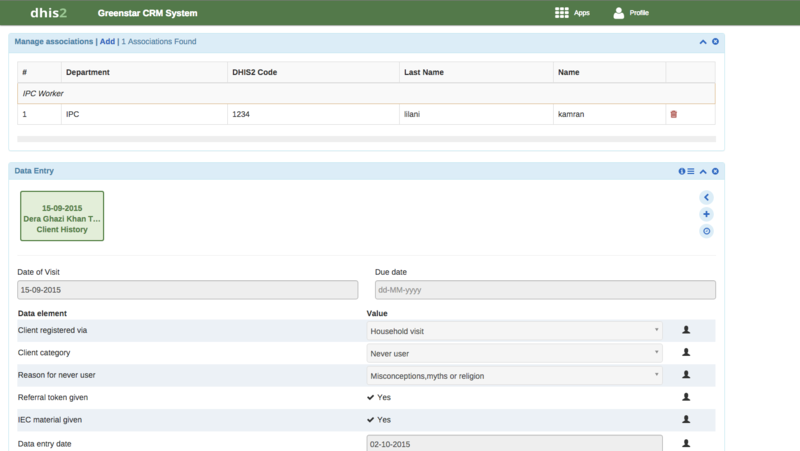 • Automating the entire process of calculating indicators and generating reports. 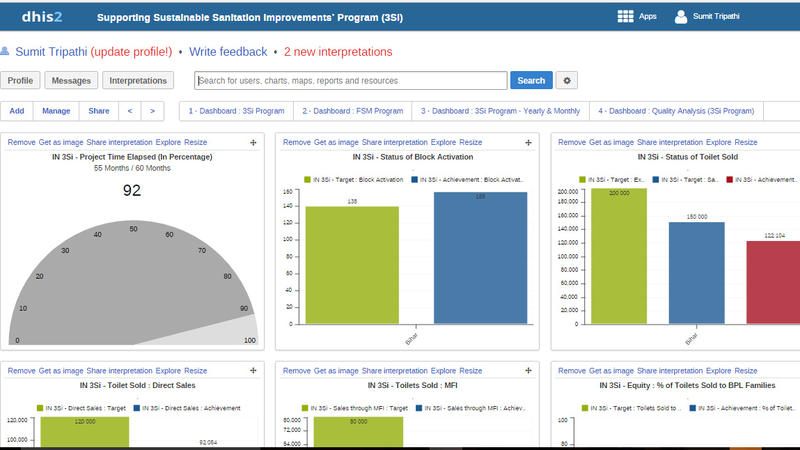 • Automated generation of report cards comparing key indicators over a period of time to help identify the effectiveness of the programme. Plan Asia Regional Office has implemented the solution for youth tracking and tracing with DHIS2 in Philippines and Indonesia. Data is gathered on a variety of indicators, including employment status and multiple socio-economic factors. Youth Unemployment is a major global crisis with significant social and economic repercussions. Several NGO’s have rolled out employment and entrepreneurial skills building programs. In these programs, participants are tracked to measure their attendance and progress and after they finish the program, they are supported in finding a job or starting their own business. Alumni are traced through a variety of predominantly labour intensive methods, such as phone calls and meetings to gather quantitative and qualitative data, which is used to measure the impact of the programs. • Creating relationships between different kind of entities, such as beneficiary/mentor/trainer etc. to capture the flow of information. • Creating various projects and interventions carried out by Plan International team and assigning them various entities as mentioned above. • Capturing of client based information from the point of registration of the beneficiary in the system, to its enrolment into respective projects and interventions collecting relevant data. • Creating ‘contact moments’ such as invitations for job fairs, seminars etc. and inviting the registered beneficiaries to such events. • Tracking the beneficiaries who have been enrolled into projects and interventions, and entering data for the specific events attended by the beneficiary. 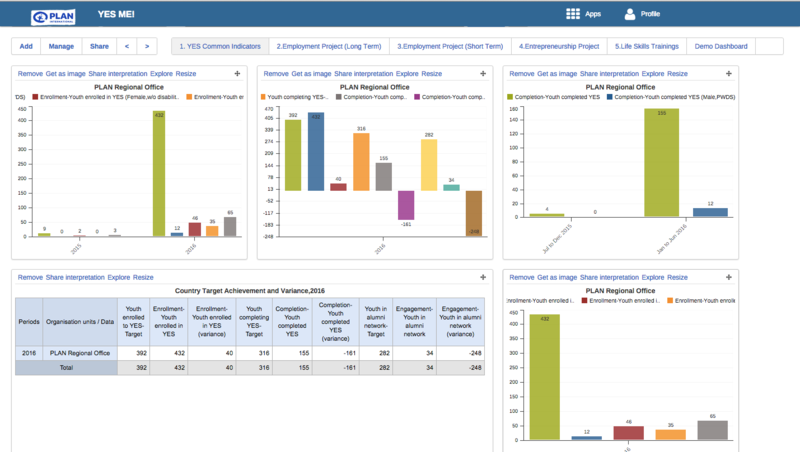 • Generation of indicators for each project, and allow for generation of custom reports, ad‐hoc reports and program specific dashboards for monitoring and evaluation exercise. • Inbound and outbound communication mechanism in form of system alerts/reminders, outbound SMS etc. 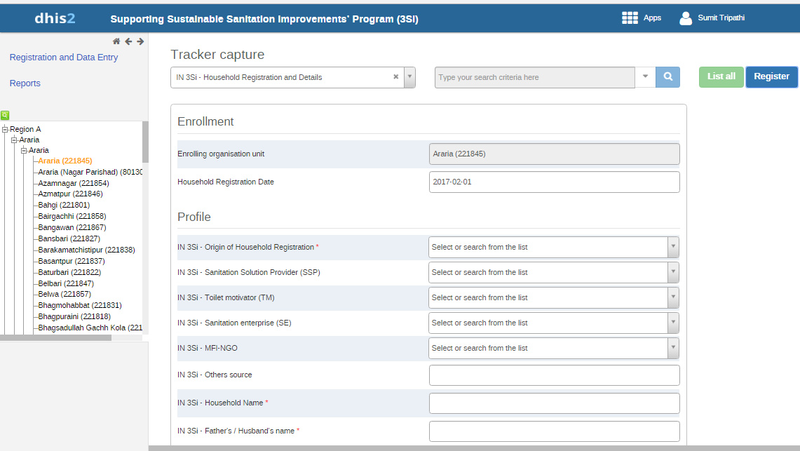 • Use of DHIS2 tracker for registration and tracking of youth for programs which provider employment solutions. • Link between beneficiaries, trainers, employers at different events of the program to track and analyse the status of the beneficiary during, as well as after the completion of the program to understand the impact of the interventions. 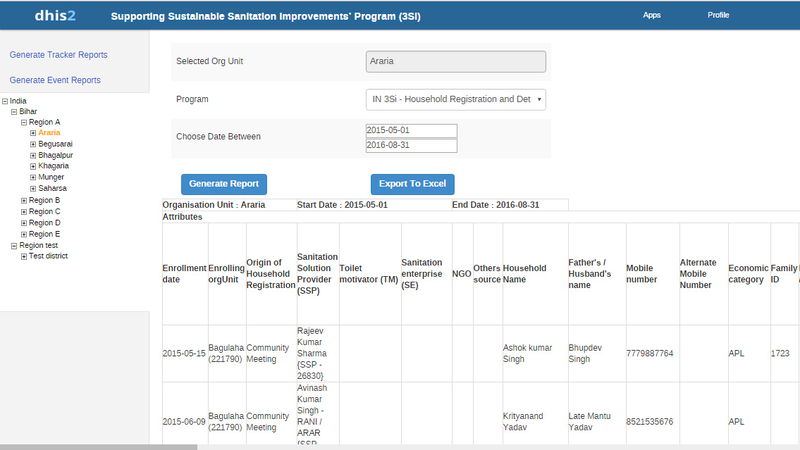 The 3Si project is an initiative by PSI India team with an objective to build an information system for easy management of data coming from the project members for various events occurring over the cycle of a successful toilet construction in the households of Bihar. 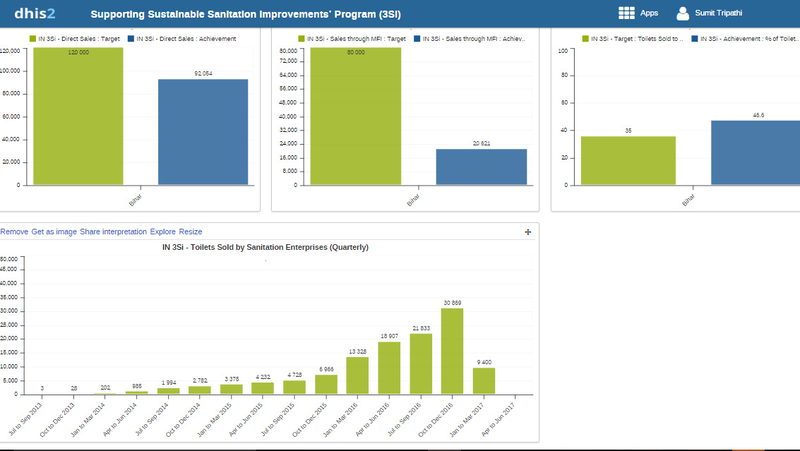 The information system helps the PSI team to track and manage the progress in terms of constructing toilets in households as per 3Si program. The application allows the field users to enter data for beneficiaries, track the progress in toilet construction and also track the quality of the toilets constructed. The state project officers can then analyse the data, manage the delays or quality issues and generate custom reports as required. 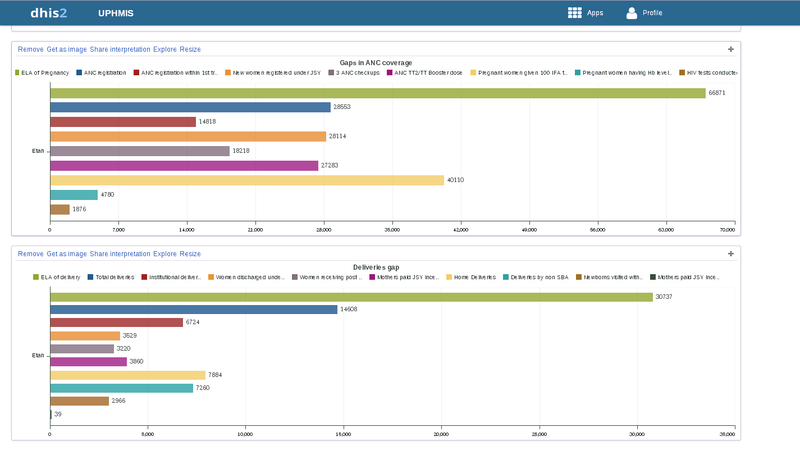 The users are also able to independently generate different dashboards based on the information needs. The application has legacy data imported from Jan 2013 to June 2016 while live data is being reported since July 2016 through both web and android platforms. DHIS2 is being used to register the patients at the district hospital, for each patient information regarding the lab sample collection and transport to the apex lab is captured as events. In addition to the specimen collection, the data for the patient lab result is also entered at district, apex and the NIMHANS lab. • Capturing patient data generating from a three tiered laboratory based surveillance mechanism. • Suspected cases of AES who meet the case definition based on the reported symptoms are registered in the system. • Lab samples collected at district lab are tested, and also sent to Apex as well as NIMHANS lab. • Each district hospital lab is linked to an Apex lab which is the medical college laboratory which has infrastructure available for carrying out tests for multiple pathogens. • NIMHANS lab, which is a state of the art laboratory infrastructure specializing in carrying out sophisticated laboratory tests for pathogens causing encephalitis and meningitis. How it works in DHIS2? • The data for patient's hospitalization outcome and the final diagnosis is entered at the level of district hospital. 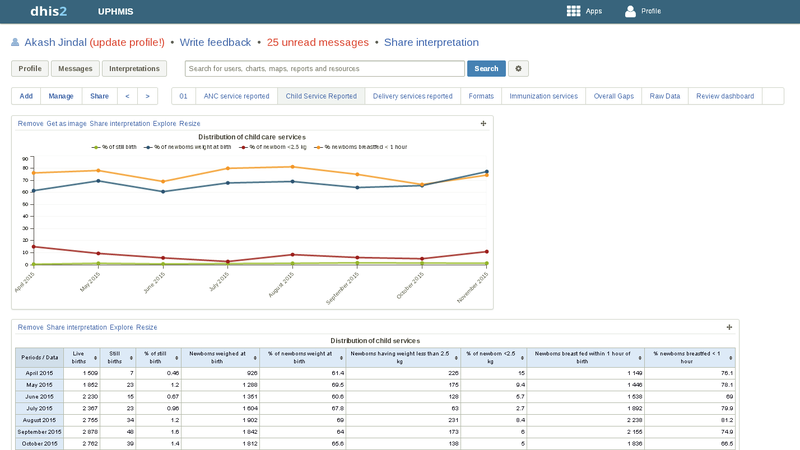 • SMS alerts have been inbuilt in the system, where the system send specific alerts to specific group of people such as identification of any positive AES case via a confirmed lab result, and in order to maintain compliance necessary alerts are generated on dispatch/acceptance of the specimen transported to the higher labs. 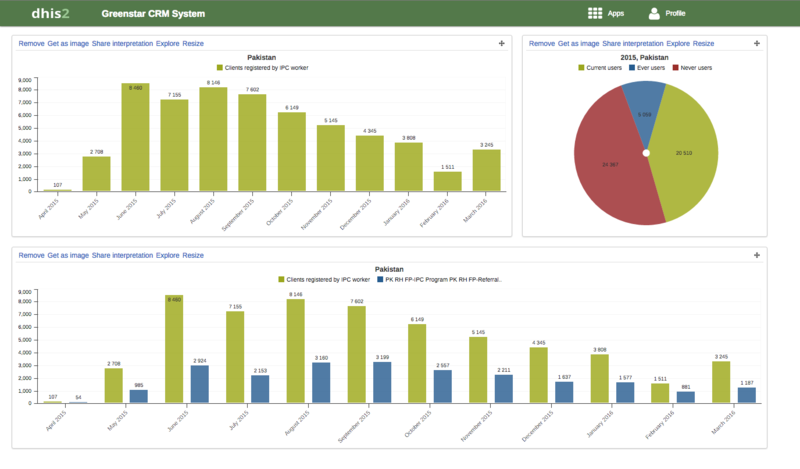 Greenstar has implemented an information system to manage the data for the family planning behavior change and adoption services, distribution of healthcare products and support services provided by various stakeholders in their service delivery framework. The data is collected by the field force, which includes IPC (inter personal communication), sales & distribution team, and a network of service providers (doctors, nurses and LHVs) at different locations across Pakistan. • To provide client based information capture from the point of care delivery, which can be either, through interaction with an IPC, or a walk-in client in any of the service providers/clinics under the Greenstar network. • To track the clients those have been referred by an IPC to a service provider to ensure they have received the services from the service provider. • To manage the supply and ordering of healthcare products supplied by Greenstar national/sub–distributors to various service providers, pharmacies, FMCGs, and wholesale outlets under the Greenstar network. • To manage the performance of the field force by monitoring their activities against the set performance standards and visit plans issued by the Greenstar’s monitoring and evaluation cell. • To evaluate the Greenstar service provider network for quality of services provided, ensuring availability of infrastructure and services at respective clinics. • Use of DHIS2 tracker for BCC activities and tracking of beneficiaries for family planning adoption and reproductive health services through the community workers, and health service providers network. • Use of associations between stakeholders and respective service delivery event to analyse not only type of services given, but also allows to monitor the performance of the service providers. The Suaahara project funded by USAID Nepal has been successfully running for the last 4 years, and is now moving towards its second phase with HKI being the primary implementer, and working in collaboration with 6 other implementing partners, and taking support from community based organisations at the district level. HKI and its implementing partners intend to use DHIS2 as their project data monitoring system for tracking the key indicators to understand the key area of interventions, the impact on health status, and making well-informed decision based on the data collected. The Suaahara II project is a five-year USAID-funded program, with a multi-sectoral approach based on a result based framework. The overall goal of the program is to reduce the prevalence of nutrition related anomalies such as being underweight, or suffering from stunting and wasting amongst the child population of less than 5 years of age. In addition, the prevalence of anaemia is also monitored in mothers as well as children. The project has implementation scope in 40 districts, 38 of which were part of the Suaahara I program, and 17 of which were implementing the Suaahara program since 2012 in Nepal. The Helen Keller International (HKI) is the lead partner of Suaahara II, other partners include CARE, Equal Access, Environment, and Public Health Organization (ENPHO), FHI360, Vijaya Development Resource Centre (VDRC), and Nutrition Technical Assistance Group (NTAG). The project components aim to facilitate team behaviour changes including improving the household nutrition, sanitation, and routine health measures, enhancing the use of quality nutrition and health services, increasing access of households to quality nutrition rich food, and working with the local government to roll out a multi sector nutrition plan. • Acting as data warehouse for all the activities covered under Suaahara II from different data collection sources such as Commcare, ODK, and data entered in DHIS2. • Facilitate processing of data in form of indicators for analysis of data collected to measure the impact of interventions taken by the Suaahara II project initiatives. 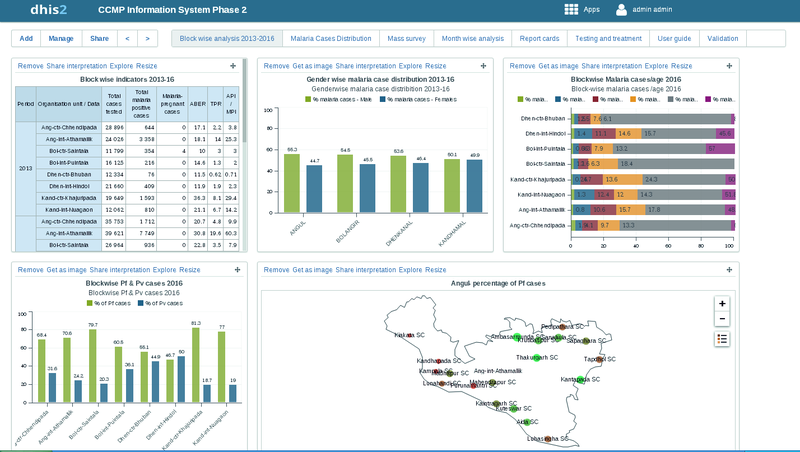 • Design and development of dashboards for monitoring and evaluation of data through effective visualisations. • Dissemination of dashboards and reports to the defined user groups for them to have access to latest data and take effective decisions.